This article is about the chemical element. For other uses, see Gallium (disambiguation). Gallium is a chemical element with symbol Ga and atomic number 31. Gallium in its solid state is slightly blue; however in its liquid state it becomes silvery white. Gallium is soft enough to be cut with shears however; if too much force is applied Gallium may fracture conchoidally. It is in group 13 of the periodic table, and thus has similarities to the other metals of the group, aluminium, indium, and thallium. Gallium does not occur as a free element in nature, but as gallium(III) compounds in trace amounts in zinc ores and in bauxite. Elemental gallium is a liquid at temperatures greater than 29.76 °C (85.57 °F) (above room temperature, but below the normal human body temperature of 37 °C (99 °F), hence, the metal will melt in a person's hands). The melting point of gallium is used as a temperature reference point. Gallium alloys are used in thermometers as a non-toxic and environmentally friendly alternative to mercury, and can withstand higher temperatures than mercury. The alloy galinstan (70% gallium, 21.5% indium, and 10% tin) has an even lower melting point of −19 °C (−2 °F), well below the freezing point of water. Since its discovery in 1875, gallium has been used to make alloys with low melting points. It is also used in semiconductors as a dopant in semiconductor substrates. Gallium is predominantly used in electronics. Gallium arsenide, the primary chemical compound of gallium in electronics, is used in microwave circuits, high-speed switching circuits, and infrared circuits. Semiconducting gallium nitride and indium gallium nitride produce blue and violet light-emitting diodes (LEDs) and diode lasers. Gallium is also used in the production of artificial gadolinium gallium garnet for jewelry. Gallium is considered a technology-critical element. Gallium has no known natural role in biology. Gallium(III) behaves in a similar manner to ferric salts in biological systems and has been used in some medical applications, including pharmaceuticals and radiopharmaceuticals. Elemental gallium is not found in nature, but it is easily obtained by smelting. Very pure gallium metal has a silvery color and its solid metal fractures conchoidally like glass. Gallium liquid expands by 3.10% when it solidifies; therefore, it should not be stored in glass or metal containers because the container may rupture when the gallium changes state. Gallium shares the higher-density liquid state with a short list of other materials that includes water, silicon, germanium, antimony, bismuth, and plutonium. Gallium attacks most other metals by diffusing into the metal lattice. For example, it diffuses into the grain boundaries of aluminium-zinc alloys and steel, making them very brittle. Gallium easily alloys with many metals, and is used in small quantities in the plutonium-gallium alloy in the plutonium cores of nuclear bombs to stabilize the plutonium crystal structure. The melting point of gallium, at 302.9146 K (29.7646 °C, 85.5763 °F), is just above room temperature, and is approximately the same as the average summer daytime temperatures in Earth's mid-latitudes. This melting point (mp) is one of the formal temperature reference points in the International Temperature Scale of 1990 (ITS-90) established by the International Bureau of Weights and Measures (BIPM). The triple point of gallium, 302.9166 K (29.7666 °C, 85.5799 °F), is used by the US National Institute of Standards and Technology (NIST) in preference to the melting point. The melting point of gallium allows it to melt in the human hand, and then refreeze if removed. The liquid metal has a strong tendency to supercool below its melting point/freezing point: Ga nanoparticles can be kept in the liquid state below 90 K. Seeding with a crystal helps to initiate freezing. Gallium is one of the four non-radioactive metals (with caesium, rubidium, and mercury) that are known to be liquid at, or near, normal room temperature. Of the four, gallium is the only one that is neither highly reactive (rubidium and caesium) nor highly toxic (mercury) and can therefore be used in metal-in-glass high-temperature thermometers. It is also notable for having one of the largest liquid ranges for a metal, and for having (unlike mercury) a low vapor pressure at high temperatures. Gallium's boiling point, 2673 K, is more than eight times higher than its melting point on the absolute scale, the greatest ratio between melting point and boiling point of any element. Unlike mercury, liquid gallium metal wets glass and skin, along with most other materials (with the exceptions of quartz, graphite, and Teflon), making it mechanically more difficult to handle even though it is substantially less toxic and requires far fewer precautions. Gallium painted onto glass is a brilliant mirror. For this reason as well as the metal contamination and freezing-expansion problems, samples of gallium metal are usually supplied in polyethylene packets within other containers. Gallium does not crystallize in any of the simple crystal structures. The stable phase under normal conditions is orthorhombic with 8 atoms in the conventional unit cell. Within a unit cell, each atom has only one nearest neighbor (at a distance of 244 pm). The remaining six unit cell neighbors are spaced 27, 30 and 39 pm farther away, and they are grouped in pairs with the same distance. Many stable and metastable phases are found as function of temperature and pressure. The bonding between the two nearest neighbors is covalent; hence Ga2 dimers are seen as the fundamental building blocks of the crystal. This explains the low melting point relative to the neighbor elements, aluminium and indium. This structure is strikingly similar to that of iodine and forms because of interactions between the single 4p electrons of gallium atoms, further away from the nucleus than the 4s electrons and the [Ar]3d10 core. This phenomenon recurs with mercury with its "pseudo-noble-gas" [Xe]4f145d106s2 electron configuration, which is liquid at room temperature. The 3d10 electrons do not shield the outer electrons very well from the nucleus and hence the first ionisation energy of gallium is greater than that of aluminium. The physical properties of gallium are highly anisotropic, i.e. have different values along the three major crystallographical axes a, b, and c (see table), producing a significant difference between the linear (α) and volume thermal expansion coefficients. The properties of gallium are strongly temperature-dependent, particularly near the melting point. For example, the coefficient of thermal expansion increases by several hundred percent upon melting. Gallium has 31 known isotopes, ranging in mass number from 56 to 86. Only two isotopes are stable and occur naturally, gallium-69 and gallium-71. Gallium-69 is more abundant: it makes up about 60.1% of natural gallium, while gallium-71 makes up the remaining 39.9%. All the other isotopes are radioactive, with gallium-67 being the longest-lived (half-life 3.261 days). Isotopes lighter than gallium-69 usually decay through beta plus decay (positron emission) or electron capture to isotopes of zinc, although the lightest few (with mass numbers 56 through 59) decay through prompt proton emission. Isotopes heavier than gallium-71 decay through beta minus decay (electron emission), possibly with delayed neutron emission, to isotopes of germanium, while gallium-70 can decay through both beta minus decay and electron capture. Gallium-67 is unique among the light isotopes in having only electron capture as a decay mode, as its decay energy is not sufficient to allow positron emission. Gallium-67 and gallium-68 (half-life 67.7 min) are both used in nuclear medicine. Gallium is found primarily in the +3 oxidation state. The +1 oxidation state is also found in some compounds, although it is less common than it is for gallium's heavier congeners indium and thallium. For example, the very stable GaCl2 contains both gallium(I) and gallium(III) and can be formulated as GaIGaIIICl4; in contrast, the monochloride is unstable above 0 °C, disproportionating into elemental gallium and gallium(III) chloride. Compounds containing Ga–Ga bonds are true gallium(II) compounds, such as GaS (which can be formulated as Ga24+(S2−)2) and the dioxan complex Ga2Cl4(C4H8O2)2. 6 as another possible gallate anion, it was not found in later work. 4, can be used as a phosphor. 2O with phosphorus at low temperatures. Gallane is unstable above −10 °C, decomposing to elemental gallium and hydrogen. Organogallium compounds are of similar reactivity to organoindium compounds, less reactive than organoaluminium compounds, but more reactive than organothallium compounds. Alkylgalliums are monomeric. Lewis acidity decreases in the order Al > Ga > In and as a result organogallium compounds do not form bridged dimers as organoaluminum compounds do. Organogallium compounds are also less reactive than organoaluminum compounds. They do form stable peroxides. These alkylgalliums are liquids at room temperature, having low melting points, and are quite mobile and flammable. Triphenylgallium is monomeric in solution, but its crystals form chain structures due to weak intermolecluar Ga···C interactions. Gallium trichloride is a common starting reagent for the formation of organogallium compounds, such as in carbogallation reactions. Gallium trichloride reacts with lithium cyclopentadienide in diethyl ether to form the trigonal planar gallium cyclopentadienyl complex GaCp3. Gallium(I) forms complexes with arene ligands such as hexamethylbenzene. Because this ligand is quite bulky, the structure of the [Ga(η6-C6Me6)]+ is that of a half-sandwich. Less bulky ligands such as mesitylene allow two ligands to be attached to the central gallium atom in a bent sandwich structure. Benzene is even less bulky and allows the formation of dimers: an example is [Ga(η6-C6H6)2] [GaCl4]·3C6H6. In 1871, the existence of gallium was first predicted by Russian chemist Dmitri Mendeleev, who named it "eka-aluminium" from its position in his periodic table. He also predicted several properties of eka-aluminium that correspond closely to the real properties of gallium, such as its density, melting point, oxide character, and bonding in chloride. Mendeleev further predicted that eka-aluminium would be discovered by means of the spectroscope, and that metallic eka-aluminium would dissolve slowly in both acids and alkalis and would not react with air. He also predicted that M2O3 would dissolve in acids to give MX3 salts, that eka-aluminium salts would form basic salts, that eka-aluminium sulfate should form alums, and that anhydrous MCl3 should have a greater volatility than ZnCl2: all of these predictions turned out to be true. Gallium was discovered using spectroscopy by French chemist Paul Emile Lecoq de Boisbaudran in 1875 from its characteristic spectrum (two violet lines) in a sample of sphalerite. Later that year, Lecoq obtained the free metal by electrolysis of the hydroxide in potassium hydroxide solution. He named the element "gallia", from Latin Gallia meaning Gaul, after his native land of France. It was later claimed that, in one of those multilingual puns so beloved by men of science in the 19th century, he had also named gallium after himself: "Le coq" is French for "the rooster" and the Latin word for "rooster" is "gallus". In an 1877 article, Lecoq denied this conjecture. Originally, de Boisbaudran determined the density of gallium as 4.7 g/cm3, the only property that failed to match Mendeleev's predictions; Mendeleev then wrote to him and suggested that he should remeasure the density, and de Boisbaudran then obtained the correct value of 5.9 g/cm3, that Mendeleev had predicted almost exactly. From its discovery in 1875 until the era of semiconductors, the primary uses of gallium were high-temperature thermometrics and metal alloys with unusual properties of stability or ease of melting (some such being liquid at room temperature). The development of gallium arsenide as a direct band gap semiconductor in the 1960s ushered in the most important stage in the applications of gallium. Gallium does not exist as a free element in the Earth's crust, and the few high-content minerals, such as gallite (CuGaS2), are too rare to serve as a primary source. The abundance in the Earth's crust is approximately 16.9 ppm. This is comparable to the crustal abundances of lead, cobalt, and niobium. Yet unlike these elements, gallium does not form its own ore deposits with concentrations of > 0.1 wt.% in ore. Rather it occurs at trace concentrations similar to the crustal value in zinc ores, and at somewhat higher values (~ 50 ppm) in aluminium ores, from both of which it is extracted as a by-product. This lack of independent deposits is due to gallium's geochemical behaviour, showing no strong enrichment in the processes relevant to the formation of most ore deposits. The United States Geological Survey (USGS) estimates that more than 1 million tons of gallium is contained in known reserves of bauxite and zinc ores. Some coal flue dusts contain small quantities of gallium, typically less than 1% by weight. However, these amounts are not extractable without mining of the host materials (see below). Thus, the availability of gallium is fundamentally determined by the rate at which bauxite, zinc ores (and coal) are extracted. Gallium is produced exclusively as a by-product during the processing of the ores of other metals. Its main source material is bauxite, the chief ore of aluminium, but minor amounts are also extracted from sulfidic zinc ores (sphalerite being the main host mineral). In the past, certain coals were an important source. During the processing of bauxite to alumina in the Bayer process, gallium accumulates in the sodium hydroxide liquor. From this it can be extracted by a variety of methods. The most recent is the use of ion-exchange resin. Achievable extraction efficiencies critically depend on the original concentration in the feed bauxite. At a typical feed concentration of 50 ppm, about 15% of the contained gallium is extractable. The remainder reports to the red mud and aluminium hydroxide streams. Gallium is removed from the ion-exchange resin in solution. Electrolysis then gives gallium metal. For semiconductor use, it is further purified with zone melting or single-crystal extraction from a melt (Czochralski process). Purities of 99.9999% are routinely achieved and commercially available. Its by-product status means that gallium production is constrained by the amount of bauxite, sulfidic zinc ores (and coal) extracted per year. Therefore, its availability needs to be discussed in terms of supply potential. The supply potential of a by-product is defined as that amount which is economically extractable from its host materials per year under current market conditions (i.e. technology and price). Reserves and resources are not relevant for by-products, since they cannot be extracted independently from the main-products. Recent estimates put the supply potential of gallium at a minimum of 2,100 t/yr from bauxite, 85 t/yr from sulfidic zinc ores, and potentially 590 t/yr from coal. These figures are significantly greater than current production (375 t in 2016). Thus, major future increases in the by-product production of gallium will be possible without significant increases in production costs or price. The average price in for low-grade gallium was $120 per kilogram in 2016 and $135-140 per kilogram in 2017. In 2017, the world's production of low-grade gallium was ca. 315 tons — an increase of 15% from 2016. China, Japan, South Korea, Russia, and Ukraine were the leading producers, while Germany ceased primary production of gallium in 2016. The yield of high-purity gallium was ca. 180 tons, mostly originating from China, Japan, Slovakia, UK and U.S. The 2017 world annual production capacity was estimated at 730 tons for low-grade and 320 tons for refined gallium. China produced ca. 250 tons of low-grade gallium in 2016 and ca. 300 tons in 2017. 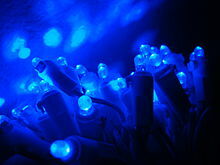 It also accounted for more than half of global LED production. Semiconductor applications dominate the commercial demand for gallium, accounting for 98% of the total. The next major application is for gadolinium gallium garnets. Extremely high-purity (>99.9999%) gallium is commercially available to serve the semiconductor industry. Gallium arsenide (GaAs) and gallium nitride (GaN) used in electronic components represented about 98% of the gallium consumption in the United States in 2007. About 66% of semiconductor gallium is used in the U.S. in integrated circuits (mostly gallium arsenide), such as the manufacture of ultra-high-speed logic chips and MESFETs for low-noise microwave preamplifiers in cell phones. About 20% of this gallium is used in optoelectronics. Worldwide, gallium arsenide makes up 95% of the annual global gallium consumption. It amounted $7.5 billion in 2016, with 53% originating from cell phones, 27% from wireless communications, and the rest from automotive, consumer, fiber-optic, and military applications. The recent increase in GaAs consumption is mostly related to the emergence of 3G and 4G smartphones, which use 10 times more GaAs than older models. Gallium arsenide and gallium nitride can also be found in a variety of optoelectronic devices which had a market share of $15.3 billion in 2015 and $18.5 billion in 2016. Aluminium gallium arsenide (AlGaAs) is used in high-power infrared laser diodes. The semiconductors gallium nitride and indium gallium nitride are used in blue and violet optoelectronic devices, mostly laser diodes and light-emitting diodes. For example, gallium nitride 405 nm diode lasers are used as a violet light source for higher-density Blu-ray Disc compact data disc drives. Other major application of gallium nitride are cable television transmission, commercial wireless infrastructure, power electronics, and satellites. The GaN radio frequency device market alone was estimated at $370 million in 2016 and $420 million in 2016. Multijunction photovoltaic cells, developed for satellite power applications, are made by molecular-beam epitaxy or metalorganic vapour-phase epitaxy of thin films of gallium arsenide, indium gallium phosphide, or indium gallium arsenide. The Mars Exploration Rovers and several satellites use triple-junction gallium arsenide on germanium cells. Gallium is also a component in photovoltaic compounds (such as copper indium gallium selenium sulfide Cu(In,Ga)(Se,S)2) used in solar panels as a cost-efficient alternative to crystalline silicon. Gallium readily alloys with most metals, and is used as an ingredient in low-melting alloys. The nearly eutectic alloy of gallium, indium, and tin is a room temperature liquid used in medical thermometers. This alloy, with the trade-name Galinstan (with the "-stan" referring to the tin, stannum in Latin), has a low freezing point of −19 °C (−2.2 °F). 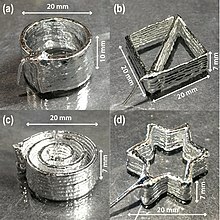 It has been suggested that this family of alloys could also be used to cool computer chips in place of water. Gallium alloys have been evaluated as substitutes for mercury dental amalgams, but these materials have yet to see wide acceptance. Because gallium wets glass or porcelain, gallium can be used to create brilliant mirrors. When the wetting action of gallium-alloys is not desired (as in Galinstan glass thermometers), the glass must be protected with a transparent layer of gallium(III) oxide. The plutonium used in nuclear weapon pits is stabilized in the δ phase and made machinable by alloying with gallium. Although gallium has no natural function in biology, gallium ions interact with processes in the body in a manner similar to iron(III). Because these processes include inflammation, a marker for many disease states, several gallium salts are used (or are in development) as pharmaceuticals and radiopharmaceuticals in medicine. Interest in the anticancer properties of gallium emerged when it was discovered that 67Ga(III) citrate injected in tumor-bearing animals localized to sites of tumor. Clinical trials have shown gallium nitrate to have antineoplastic activity against non-Hodgkin’s lymphoma and urothelial cancers. A new generation of gallium-ligand complexes such as tris(8-quinolinolato)gallium(III) (KP46) and gallium maltolate has emerged. Gallium nitrate (brand name Ganite) has been used as an intravenous pharmaceutical to treat hypercalcemia associated with tumor metastasis to bones. Gallium is thought to interfere with osteoclast function, and the therapy may be effective when other treatments have failed. Gallium maltolate, an oral, highly absorbable form of gallium(III) ion, is an anti-proliferative to pathologically proliferating cells, particularly cancer cells and some bacteria that accept it in place of ferric iron (Fe3+). Researchers are conducting clinical and preclinical trials on this compound as a potential treatment for a number of cancers, infectious diseases, and inflammatory diseases. When gallium ions are mistakenly taken up in place of iron(III) by bacteria such as Pseudomonas, the ions interfere with respiration, and the bacteria die. This happens because iron is redox-active, allowing the transfer of electrons during respiration, while gallium is redox-inactive. A complex amine-phenol Ga(III) compound MR045 is selectively toxic to parasites resistant to chloroquine, a common drug against malaria. Both the Ga(III) complex and chloroquine act by inhibiting crystallization of hemozoin, a disposal product formed from the digestion of blood by the parasites. Gallium-67 salts such as gallium citrate and gallium nitrate are used as radiopharmaceutical agents in the nuclear medicine imaging known as gallium scan. The radioactive isotope 67Ga is used, and the compound or salt of gallium is unimportant. The body handles Ga3+ in many ways as though it were Fe3+, and the ion is bound (and concentrates) in areas of inflammation, such as infection, and in areas of rapid cell division. This allows such sites to be imaged by nuclear scan techniques. Gallium-68, a positron emitter with a half-life of 68 min, is now used as a diagnostic radionuclide in PET-CT when linked to pharmaceutical preparations such as DOTATOC, a somatostatin analogue used for neuroendocrine tumors investigation, and DOTA-TATE, a newer one, used for neuroendocrine metastasis and lung neuroendocrine cancer, such as certain types of microcytoma. Gallium-68's preparation as a pharmaceutical is chemical, and the radionuclide is extracted by elution from germanium-68, a synthetic radioisotope of germanium, in gallium-68 generators. Gallium is used for neutrino detection. Possibly the largest amount of pure gallium ever collected in a single spot is the Gallium-Germanium Neutrino Telescope used by the SAGE experiment at the Baksan Neutrino Observatory in Russia. This detector contains 55–57 tonnes (~9 cubic metres) of liquid gallium. Another experiment was the GALLEX neutrino detector operated in the early 1990s in an Italian mountain tunnel. The detector contained 12.2 tons of watered gallium-71. Solar neutrinos caused a few atoms of 71Ga to become radioactive 71Ge, which were detected. This experiment showed that the solar neutrino flux is 40% less than theory predicted. This deficit was not explained until better solar neutrino detectors and theories were constructed (see SNO). Gallium is also used as a liquid metal ion source for a focused ion beam. For example, a focused gallium-ion beam was used to create the world's smallest book, Teeny Ted from Turnip Town. Another use of gallium is as an additive in glide wax for skis, and other low-friction surface materials. A well-known practical joke among chemists is to fashion gallium spoons and use them to serve tea to unsuspecting guests, since gallium has a similar appearance to its lighter homolog aluminium. The spoons then melt in the hot tea. 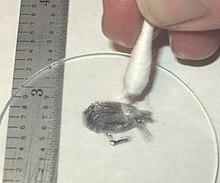 Metallic gallium is not toxic. However, exposure to gallium halide complexes can result in acute toxicity. The Ga3+ ion of soluble gallium salts tends to form the insoluble hydroxide when injected in large doses; precipitation of this hydroxide resulted in nephrotoxicity in animals. In lower doses, soluble gallium is tolerated well and does not accumulate as a poison, instead being excreted mostly through urine. Excretion of gallium occurs in two phases: the first phase has a biological half-life of 1 hour, while the second has a biological half-life of 25 hours. ^ a b Zhang Y; Evans JRG; Zhang S (2011). "Corrected Values for Boiling Points and Enthalpies of Vaporization of Elements in Handbooks". J. Chem. Eng. Data. 56 (2): 328–337. doi:10.1021/je1011086. ^ Hofmann, Patrick (1997). Colture. Ein Programm zur interaktiven Visualisierung von Festkörperstrukturen sowie Synthese, Struktur und Eigenschaften von binären und ternären Alkali- und Erdalkalimetallgalliden (PDF) (in German). PhD Thesis, ETH Zurich. p. 72. doi:10.3929/ethz-a-001859893. ISBN 3728125970. ^ a b c d Frenzel, Max; Ketris, Marina P.; Seifert, Thomas; Gutzmer, Jens (March 2016). "On the current and future availability of gallium". Resources Policy. 47: 38–50. doi:10.1016/j.resourpol.2015.11.005. ^ Zhao, Chao; Alfaraj, Nasir; Subedi, Ram Chandra; Liang, Jian Wei; Alatawi, Abdullah A.; Alhamoud, Abdullah A.; Ebaid, Mohamed; Alias, Mohd Sharizal; Ng, Tien Khee; Ooi, Boon S. (2019). "III-nitride nanowires on unconventional substrates: From materials to optoelectronic device applications". Progress in Quantum Electronics. 61: 1–31. doi:10.1016/j.pquantelec.2018.07.001. Retrieved 29 March 2019. ^ Tsai, W. L; Hwu, Y.; Chen, C. H.; Chang, L. W.; Je, J. H.; Lin, H. M.; Margaritondo, G. (2003). "Grain boundary imaging, gallium diffusion and the fracture behavior of Al–Zn Alloy – An in situ study". Nuclear Instruments and Methods in Physics Research Section B. 199: 457–463. Bibcode:2003NIMPB.199..457T. doi:10.1016/S0168-583X(02)01533-1. ^ Vigilante, G. N.; Trolano, E.; Mossey, C. (June 1999). "Liquid Metal Embrittlement of ASTM A723 Gun Steel by Indium and Gallium". Defense Technical Information Center. Retrieved 2009-07-07. ^ Sublette, Cary (2001-09-09). "Section 6.2.2.1". Nuclear Weapons FAQ. Retrieved 2008-01-24. ^ Preston–Thomas, H. (1990). "The International Temperature Scale of 1990 (ITS-90)" (PDF). Metrologia. 27 (1): 3–10. Bibcode:1990Metro..27....3P. doi:10.1088/0026-1394/27/1/002. ^ "ITS-90 documents at Bureau International de Poids et Mesures". ^ Magnum, B. W.; Furukawa, G. T. (August 1990). "Guidelines for Realizing the International Temperature Scale of 1990 (ITS-90)" (PDF). National Institute of Standards and Technology. NIST TN 1265. Archived from the original (PDF) on 2003-07-04. ^ Strouse, Gregory F. (1999). "NIST realization of the gallium triple point". Proc. TEMPMEKO. 1999 (1): 147–152. Retrieved 2016-10-30. ^ Parravicini, G. B.; Stella, A.; Ghigna, P.; Spinolo, G.; Migliori, A.; d'Acapito, F.; Kofman, R. (2006). "Extreme undercooling (down to 90K) of liquid metal nanoparticles". Applied Physics Letters. 89 (3): 033123. Bibcode:2006ApPhL..89c3123P. doi:10.1063/1.2221395. ^ a b Rosebury, Fred (1992). Handbook of Electron Tube and Vacuum Techniques. Springer. p. 26. ISBN 978-1-56396-121-2. ^ Bernascino, M.; et al. (1995). "Ab initio calculations of structural and electronic properties of gallium solid-state phases". Phys. Rev. B. 52 (14): 9988–9998. Bibcode:1995PhRvB..52.9988B. doi:10.1103/PhysRevB.52.9988. ^ a b c d e f g h Wiberg, Egon; Wiberg, Nils; Holleman, Arnold Frederick (2001). Inorganic chemistry. Academic Press. ISBN 978-0-12-352651-9. ^ a b c d e f g h Downs, Anthony John (1993). Chemistry of aluminium, gallium, indium, and thallium. Springer. ISBN 978-0-7514-0103-5. ^ a b c d Eagleson, Mary, ed. (1994). Concise encyclopedia chemistry. Walter de Gruyter. p. 438. ISBN 978-3-11-011451-5. -NMR Spectroscopic Study". J Solution Chem. 37 (10): 1411–1418. doi:10.1007/s10953-008-9314-y. ^ Hampson, N. A. (1971). Harold Reginald Thirsk (ed.). Electrochemistry—Volume 3: Specialist periodical report. Great Britain: Royal Society of Chemistry. p. 71. ISBN 978-0-85186-027-5. ^ a b c d e f g h i Greenwood, N. N. (1962). Harry Julius Emeléus; Alan G. Sharpe (eds.). Advances in inorganic chemistry and radiochemistry. 5. Academic Press. pp. 94–95. ISBN 978-0-12-023605-3. ^ Madelung, Otfried (2004). Semiconductors: data handbook (3rd ed.). Birkhäuser. pp. 276–277. ISBN 978-3-540-40488-0. 4, a new phosphor". Physica. 31 (1): 113–121. Bibcode:1965Phy....31..113K. doi:10.1016/0031-8914(65)90110-2. ^ Michelle Davidson (2006). Inorganic Chemistry. Lotus Press. p. 90. ISBN 978-81-89093-39-6. ^ Arora, Amit (2005). Text Book Of Inorganic Chemistry. Discovery Publishing House. pp. 389–399. ISBN 978-81-8356-013-9. ^ Downs, Anthony J.; Pulham, Colin R. (1994). Sykes, A. G. (ed.). Advances in Inorganic Chemistry. 41. Academic Press. pp. 198–199. ISBN 978-0-12-023641-1. ^ Amemiya, Ryo (2005). "GaCl3 in Organic Synthesis". European Journal of Organic Chemistry. 2005 (24): 5145–5150. doi:10.1002/ejoc.200500512. ^ Ball, Philip (2002). The Ingredients: A Guided Tour of the Elements. Oxford University Press. p. 105. ISBN 978-0-19-284100-1. ^ a b c Greenwood and Earnshaw, p. 217. ^ de Boisbaudran, Lecoq (1835–1965). "Caractères chimiques et spectroscopiques d'un nouveau métal, le gallium, découvert dans une blende de la mine de Pierrefitte, vallée d'Argelès (Pyrénées)". Comptes Rendus. 81: 493. Retrieved 2008-09-23. ^ Weeks, Mary Elvira (1932). "The discovery of the elements. XIII. Some elements predicted by Mendeleeff". Journal of Chemical Education. 9 (9): 1605–1619. Bibcode:1932JChEd...9.1605W. doi:10.1021/ed009p1605. ^ a b c Frenzel, Max (2016). "The distribution of gallium, germanium and indium in conventional and non-conventional resources – Implications for global availability (PDF Download Available)". ResearchGate. doi:10.13140/rg.2.2.20956.18564. Retrieved 2017-06-02. ^ Burton, J. D.; Culkin, F.; Riley, J. P. (2007). "The abundances of gallium and germanium in terrestrial materials". Geochimica et Cosmochimica Acta. 16 (1): 151–180. Bibcode:1959GeCoA..16..151B. doi:10.1016/0016-7037(59)90052-3. ^ Frenzel, Max; Hirsch, Tamino; Gutzmer, Jens (July 2016). "Gallium, germanium, indium, and other trace and minor elements in sphalerite as a function of deposit type — A meta-analysis". Ore Geology Reviews. 76: 52–78. doi:10.1016/j.oregeorev.2015.12.017. ^ a b Kramer, Deborah A. "Mineral Commodity Summary 2006: Gallium" (PDF). United States Geological Survey. Retrieved 2008-11-20. ^ Kramer, Deborah A. "Mineral Yearbook 2006: Gallium" (PDF). United States Geological Survey. Retrieved 2008-11-20. ^ Xiao-quan, Shan; Wen, Wang & Bei, Wen (1992). "Determination of gallium in coal and coal fly ash by electrothermal atomic absorption spectrometry using slurry sampling and nickel chemical modification". Journal of Analytical Atomic Spectrometry. 7 (5): 761. doi:10.1039/JA9920700761. ^ "Gallium in West Virginia Coals". West Virginia Geological and Economic Survey. 2002-03-02. ^ Font, O; Querol, Xavier; Juan, Roberto; Casado, Raquel; Ruiz, Carmen R.; López-Soler, Ángel; Coca, Pilar; Peña, Francisco García (2007). "Recovery of gallium and vanadium from gasification fly ash". Journal of Hazardous Materials. 139 (3): 413–23. doi:10.1016/j.jhazmat.2006.02.041. PMID 16600480. ^ Headlee, A. J. W. & Hunter, Richard G. (1953). "Elements in Coal Ash and Their Industrial Significance". Industrial and Engineering Chemistry. 45 (3): 548–551. doi:10.1021/ie50519a028. ^ a b Moskalyk, R. R. (2003). "Gallium: the backbone of the electronics industry". Minerals Engineering. 16 (10): 921–929. doi:10.1016/j.mineng.2003.08.003. ^ Frenzel, M; Tolosana-Delgado, R; Gutzmer, J (2015). "Assessing the supply potential of high-tech metals – A general method". Resources Policy. 46: 45–58. doi:10.1016/j.resourpol.2015.08.002. ^ Frenzel, Max; Mikolajczak, Claire; Reuter, Markus A.; Gutzmer, Jens (June 2017). "Quantifying the relative availability of high-tech by-product metals – The cases of gallium, germanium and indium". Resources Policy. 52: 327–335. doi:10.1016/j.resourpol.2017.04.008. ^ Gallium – In: USGS Mineral Commodity Summaries (PDF). United States Geological Survey. 2017. ^ Greber, J. F. (2012) "Gallium and Gallium Compounds" in Ullmann's Encyclopedia of Industrial Chemistry, Wiley-VCH, Weinheim, doi:10.1002/14356007.a12_163. ^ Coleman, James J.; Jagadish, Chennupati; Catrina Bryce, A. (2012-05-02). Advances in Semiconductor Lasers. pp. 150–151. ISBN 978-0-12-391066-0. ^ Crisp, D.; Pathare, A.; Ewell, R. C. (2004). "The performance of gallium arsenide/germanium solar cells at the Martian surface". Acta Astronautica. 54 (2): 83–101. Bibcode:2004AcAau..54...83C. doi:10.1016/S0094-5765(02)00287-4. ^ Alberts, V.; Titus J.; Birkmire R. W. (2003). "Material and device properties of single-phase Cu(In,Ga)(Se,S)2 alloys prepared by selenization/sulfurization of metallic alloys". Thin Solid Films. 451–452: 207–211. Bibcode:2004TSF...451..207A. doi:10.1016/j.tsf.2003.10.092. ^ Surmann, P; Zeyat, H (Nov 2005). "Voltammetric analysis using a self-renewable non-mercury electrode". Analytical and Bioanalytical Chemistry. 383 (6): 1009–13. doi:10.1007/s00216-005-0069-7. ISSN 1618-2642. PMID 16228199. ^ Knight, Will (2005-05-05). "Hot chips chilled with liquid metal". Retrieved 2008-11-20. ^ United States. Office of Naval Research. Committee on the Basic Properties of Liquid Metals, U.S. Atomic Energy Commission (1954). Liquid-metals handbook. U.S. Govt. Print. Off. p. 128. ^ Besmann, Theodore M. (2005). "Thermochemical Behavior of Gallium in Weapons-Material-Derived Mixed-Oxide Light Water Reactor (LWR) Fuel". Journal of the American Ceramic Society. 81 (12): 3071–3076. doi:10.1111/j.1151-2916.1998.tb02740.x. ^ Chitambar, Christopher R. (2018). "Chapter 10. Gallium Complexes as Anticancer drugs". In Sigel, Astrid; Sigel, Helmut; Freisinger, Eva; Sigel, Roland K. O. (eds.). Metallo-Drugs: Development and Action of Anticancer Agents. Metal Ions in Life Sciences. 18. Berlin: de Gruyter GmbH. pp. 281–301. doi:10.1515/9783110470734-016. ISBN 9783110470734. PMID 29394029. ^ "gallium nitrate". Archived from the original on 2009-06-08. Retrieved 2009-07-07. ^ Bernstein, L. R.; Tanner, T.; Godfrey, C. & Noll, B. (2000). "Chemistry and Pharmacokinetics of Gallium Maltolate, a Compound With High Oral Gallium Bioavailability". Metal-Based Drugs. 7 (1): 33–47. doi:10.1155/MBD.2000.33. PMC 2365198. PMID 18475921. ^ "A Trojan-horse strategy selected to fight bacteria". INFOniac.com. 2007-03-16. Retrieved 2008-11-20. ^ Smith, Michael (2007-03-16). "Gallium May Have Antibiotic-Like Properties". MedPage Today. Retrieved 2008-11-20. ^ Goldberg D. E.; Sharma V.; Oksman A.; Gluzman I. Y.; Wellems T. E.; Piwnica-Worms D. (1997). "Probing the chloroquine resistance locus of Plasmodium falciparum with a novel class of multidentate metal(III) coordination complexes". J. Biol. Chem. 272 (10): 6567–72. doi:10.1074/jbc.272.10.6567. PMID 9045684. ^ Biot, Christophe; Dive, Daniel (2010). "Bioorganometallic Chemistry and Malaria". Medicinal Organometallic Chemistry. Topics in Organometallic Chemistry. 32. p. 155. doi:10.1007/978-3-642-13185-1_7. ISBN 978-3-642-13184-4. ^ a b Nordberg, Gunnar F.; Fowler, Bruce A.; Nordberg, Monica (7 August 2014). Handbook on the Toxicology of Metals (4th ed.). Academic Press. pp. 788–90. ISBN 978-0-12-397339-9. ^ Banerjee, Sangeeta Ray; Pomper, Martin G. (June 2013). "Clinical Applications of Gallium-68". Appl. Radiat. Isot. 76: 2–13. doi:10.1016/j.apradiso.2013.01.039. PMC 3664132. PMID 23522791. ^ "Russian American Gallium Experiment". 2001-10-19. Archived from the original on 2010-07-05. Retrieved 2009-06-24. ^ "Neutrino Detectors Experiments: GALLEX". 1999-06-26. Retrieved 2008-11-20. ^ "Nano lab produces world's smallest book". Simon Fraser University. 11 April 2007. Retrieved 31 January 2013. ^ Kean, Sam (2010). The Disappearing Spoon: And Other True Tales of Madness, Love, and the History of the World from the Periodic Table of the Elements. Boston: Little, Brown and Company. ISBN 978-0-316-05164-4. ^ "Gallium 203319". Sigma Aldrich. ^ "MSDS – 203319". Sigma Aldrich. ^ Ivanoff, C. S.; Ivanoff, A. E.; Hottel, T. L. (February 2012). "Gallium poisoning: a rare case report". Food Chem. Toxicol. 50 (2): 212–5. doi:10.1016/j.fct.2011.10.041. PMID 22024274. Wikimedia Commons has media related to Gallium. Wikisource has the text of the 1911 Encyclopædia Britannica article Gallium. This page was last edited on 18 April 2019, at 04:23 (UTC).